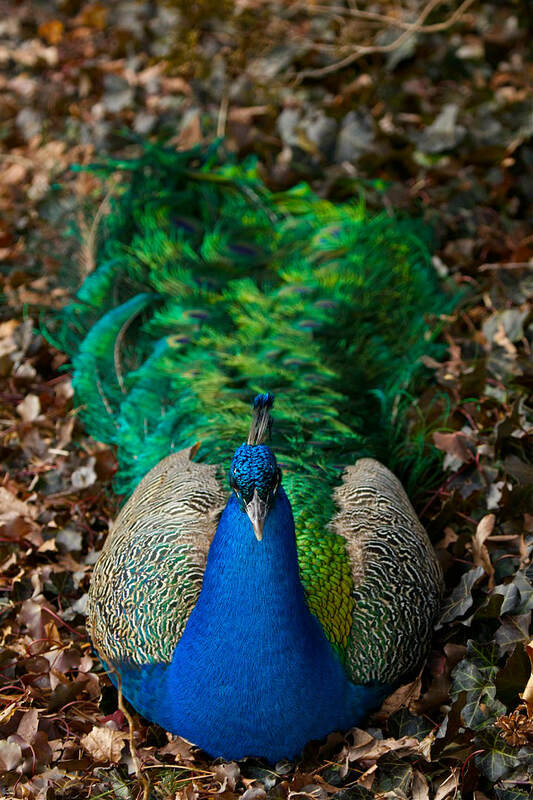 Males, called peacocks, have iridescent royal blue plumage with a crest on the crown of the head. They have 1-5’ long tail covert feathers over their tail during the summer months. These decorative feathers are metallic green, ending in an iridescent eye spot of blue, green and bronze. Between 100-175 of these eye spots make up the male’s train, which he erects and spreads into an impressive fan to attract hens for breeding. The tail coverts are shed at the end of breeding season each year in late summer. 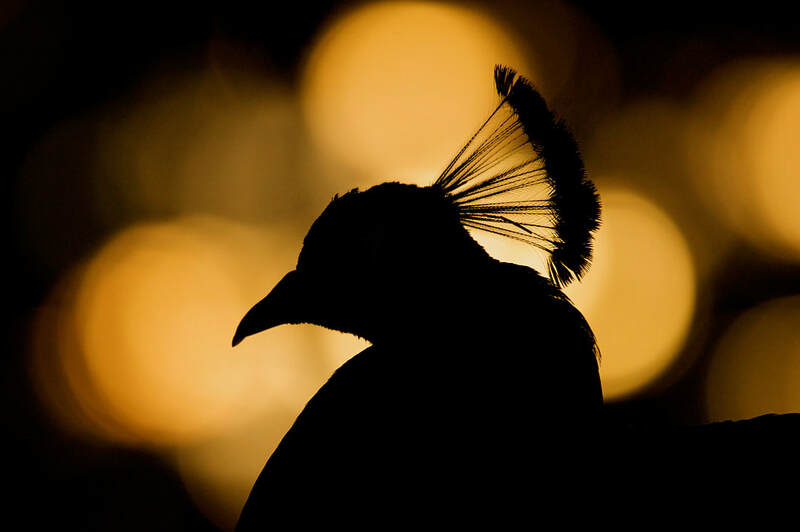 Blue peafowl have black and white striped feathers on their shoulders (or all black if they are Black-Shouldered Peacocks), light brown flight feathers and gray tail feathers. The head is covered in tiny metallic feathers and the white skin above and under the eye gives a striped effect. Eye color is mainly brown. The beak, legs and feet are a light gray. Females, or peahens, are much plainer in colors of olive, gray and brown, with a white underside and green metallic feathers on the neck. These colors camouflage them better during incubation. They do not have the long covert feathers like the males. Peachicks are yellow and brown and resemble young turkeys. Open country bordering thick forest vegetation and streams, villages and on agricultural land. They are native to Sri Lanka, Pakistan, and India, where they are the national bird. There are also feral and domestic populations throughout the world. In the wild, their diet consists of berries, fruits, grain and green crops, insects, small reptiles and mammals. At the Zoo, our peacocks forage for seeds, insects, flowers, and are fed a mixture of seeds, pelleted bird diet, and occasionally greens, fruit and meat. Peafowl can live up to 30 years in captivity. 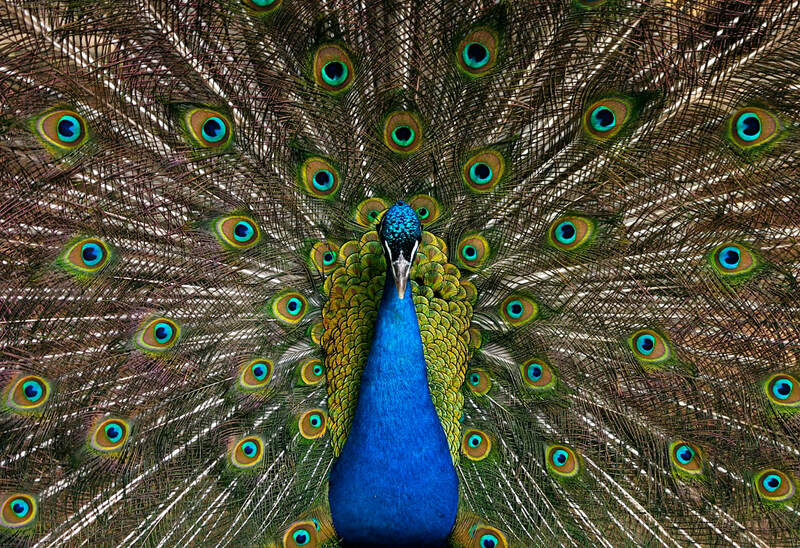 By age 3, peacocks reach full plumage and are sexually mature. Peahens usually look for the male with the longest covert feathers and the greatest number of eye spots, or ocelli. These will increase as the male matures, up until he is about 12. Males are territorial and defend a small area called a lek. Females may look over several males before choosing a mate. Peahens lay 3-12 eggs in a depression that they have scratched in the ground and hidden in vegetation. They will incubate their eggs for about 30 days and care for the chicks on their own. Peachicks can run and defend themselves almost immediately after hatching. Common in most areas of their natural range. Peafowl have also become a popular domestic bird and have been bred to create many different color varieties. ​Many Zoo visitors are surprised to learn that these large birds can fly. They prefer to walk or run but are able to fly to impressive heights to roost in trees or get away from something that is bothering them. Although their feathers are very pretty, please remember not to try to touch or pull them. The birds live here at the Zoo and deserve our respect. By keeping a safe distance, you will be able to better observe their majestic beauty. Since the Zoo opened in 1922, visitors have been able to see these magnificent birds roaming the grounds. Peafowl are the largest members of the pheasant family, weighing about 14 pounds. People of many different cultures have kept peafowl in captivity for centuries, and they even appear in ancient Roman, Egyptian and Greek history and mythology. In some cultures, the birds are considered sacred and are allowed to graze on food crops.